The prehistoric exhibition of the Danish National Museum in Copenhagen has been closed for almost two years. But in May 2008 it reopens. The new exhibition has been possible thanks to a donation of 4,8 million Euro from the Danish shipping company Mærsk. The new Denmark's Prehistory exhibition is designed to satisfy both the impatient tourist and the serious archaeologically interested visitor. The exhibition is organized with the highlights of the museum in the centre. It makes it easy for busy tourists to see The Chariot of the Sun, The Gundestrup Cauldron and the reconstruction of the famous two Golden Horns and the almost two kilo golden Tissø Ring from Viking age. Other finds are to be find in surrounding rooms making it possible for more interested visitors to study the archaeological finds more carefully. The exhibition starts with the last Ice Age 14.500 years ago and includes stone age, bronze age, iron age and the Viking age which ended 900 years ago. 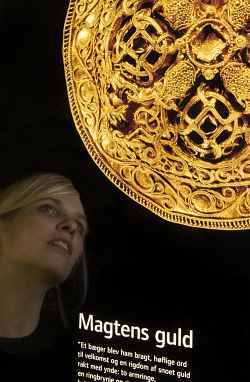 The main focus is of course Danish history but the exhibition also has many windows abroad - also because many of the best known Danish finds originally came from other parts of the World. Also the Viking age has got special rooms for exhibition. 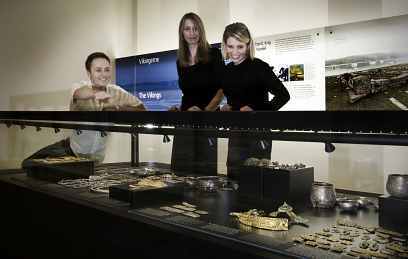 Among others the famous finds from the kings of Jelling are exhibited in a special Jelling Room. 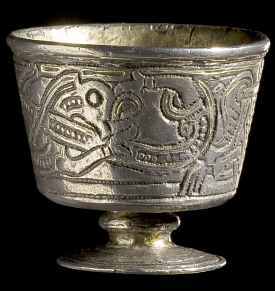 Here it is possible to see the so-called Gorm's Cup which was found in the original grave of King Gorm - the father of Harald Bluetooth. Compared with former prehistoric exhibitions of the National Museum there are many changes. Almost half of the 12.000 exhibited finds are new and not permanently exhibited before. 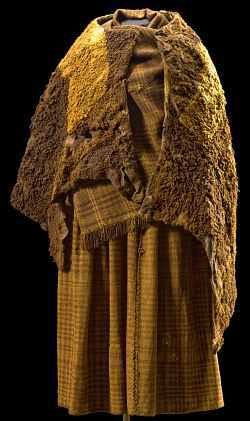 Among the highlights are the Woman from Huldremose who was wearing the best preserved dress from iron age found in Denmark. Denmark's Prehistory covers 2200 square meters and is a permanent exhibition open at all opening hours of the National Museum. Read more about the National Museum in Copenhagen.